On different mornings, carnivals and festivals the children often need a carnival costume, and today is extremely popular among children becoming costumes in which they can feel closer to your favorite comic book heroes and cartoons. One of these characters, beloved by many children, is spider-man, and stitch child costume man-spider for you is not difficult. Where to find a card with characters from "spider-Man"
White grid make two identical parts, reminiscent of the two elongated eyes. Red knit take two copies of the form for the mask-head, tapering to the neck. Of the same red knit fabricate parts for two long gloves without fingers – total should have four parts. Then cut out detail to waist and upper part of the suitand the back and front. You will also need two flat square of red knit. 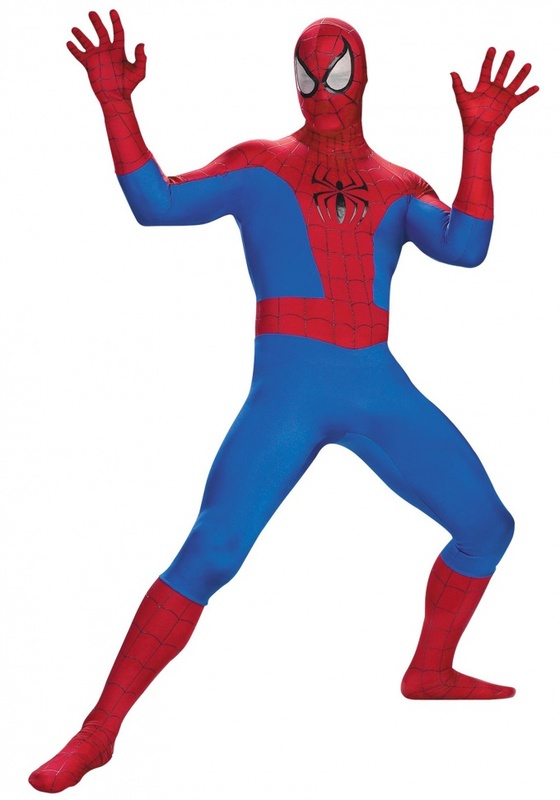 Blue Jersey will have plenty of other parts of the costumeand focusing on the image of the man-spider from the movie or comics. You need the blue insert in a turtleneck and blue inserts in the sleeves. Also of blue cloth you need to find details for formfitting pants. At the front of the mask, cut two holes that match with the shape of the mesh eyes, and their panel of narrow black braid. To braid vsheyte details for eyes in sheer mesh. Sew together the front and rear parts of the mask. Then go to sewing jackets – align the back and shortened the front part of red knitwear, and then take cut out of blue panels and sew together the upper part of the suit. To the lower edge of the turtleneck, sew the waistband. Lay on the table details for the legs and each leg sew the cuff of squares of red knit. Sew the cuff of the sock from the same red cotton, and then fully stepping prostrochite seams. Sew gloves and handle the slices. In order to paint the finished costume web, take silver liner for fabric painting or silver marker for textiles and gently apply a pattern in the form of web on the suit. To paint the head, put the mask from the suitand the balloon. Use for sewing knitted stitch and do not forget to handle the slices knit overlock. To suit spider-Man was more believable, search the Internet for images from the book or photos from the film. Try as accurately as possible to take on the characteristics of the costume of your chosen hero.